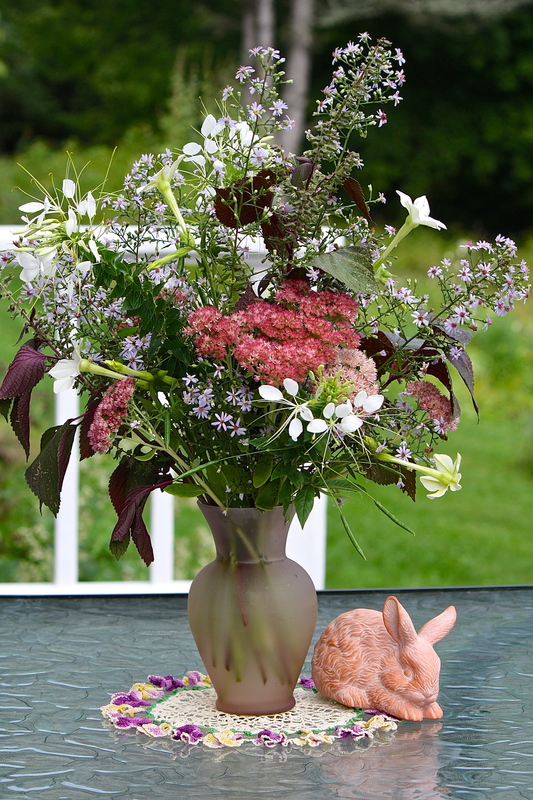 For this week’s vase, I’ve used mauve heads of sedum (S. ‘Autumn Joy’), which are just beginning to deepen in color in my garden, maroon-purple sprigs of shiso (Perilla frutescens), an annual of the mint family that readily self-sows in my herb bed, and one of my favorite flowers at this time of year, heart-leaved aster, also known as blue wood aster (Symphyotrichum cordifolium). This aster has attractive heart-shaped leaves, is covered with purple stars in September and is a long-lasting cut flower. Shiso is a native of east Asia with heavily-veined, attractive purple foliage and was brought to the U.S. by immigrants, who use it as food and medicine. It can be used in stir-frying like basil, similarly possessing a strong flavor that reminds me of licorice. It has many medicinal properties which you can read about here. It self-sows to the point of invasiveness, but it is easy enough to control by weeding out unwanted seedlings in the spring. To brighten things up, I added white spider flower (Cleome hassleriana) and my stalwart, white flowering tobacco (Nicotiana alata). Both self-sow in my garden every year and are my go-to flower when I need white in an arrangement. 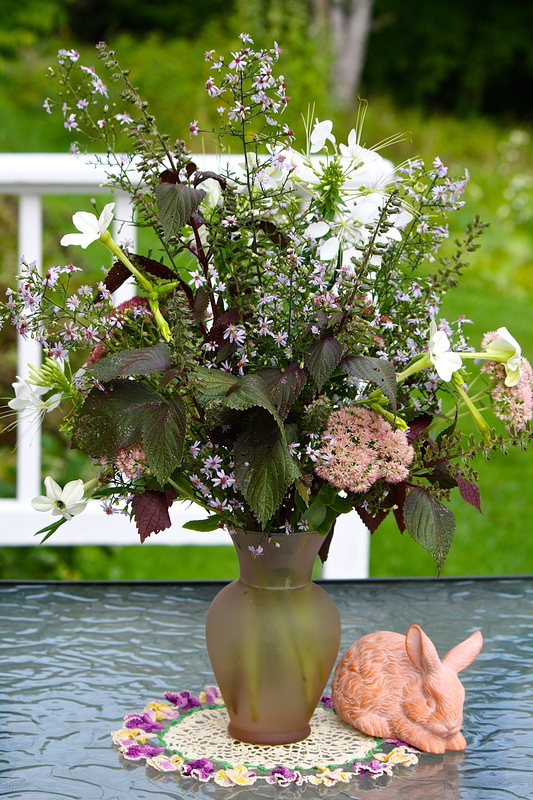 My frosted, pink glass vase goes well with the floral colors this week, as does the terracotta bunny. I’ve used my vintage, crocheted pansy doily, which was admired by Cathy at Words and Herbs when I used it under a vase in June. She created one of her own over the summer from the original 1949 pattern that her sister found on the internet. View her post to see what a great job she did! Isn’t the internet wonderful? 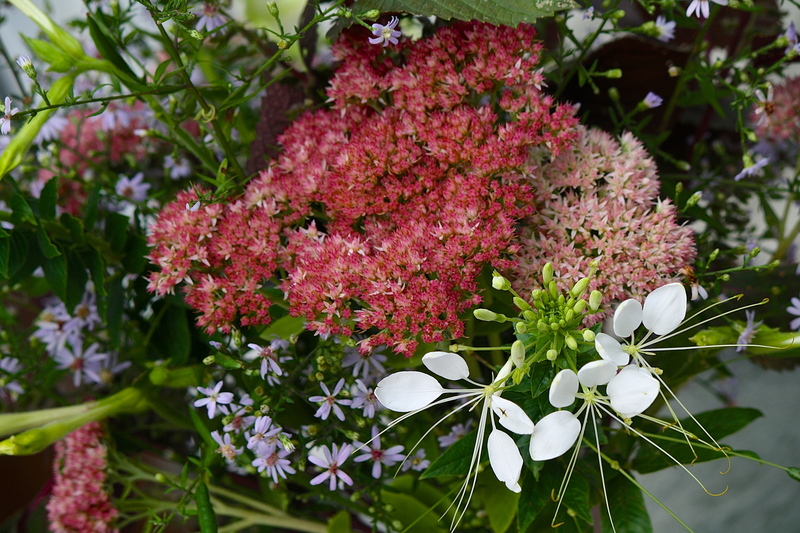 This entry was posted in Country Gardening, My Photos and tagged blue wood aster, Cleome hassleriana, flower arrangement, gardens, In a Vase on Monday, meme, native asters, Nicotiana alata, Perilla frutescens, photography, Sedum 'Autumn Joy', shiso, Weekly Vase Challenge. Bookmark the permalink. Eliza I love the coloring of the glass in your vase and it blends perfectly with the blooms and foliage for this late summer look…really stunning! You have achieved a lovely balance of form and texture in your vase this week Eliza, it’s really stylish. I have a similar Aster but it isn’t yet in flower, I read with amazement about Cathy’s sister finding the pattern for the doily, as you say isn’t the internet incredible – sometimes at least. Thank you, Christina! I was amazed that they found it – it was a thrill to see her rendition, she did such a great job! Beautiful doily, goes so well with the flowers. You have worked wonders again Eliza. Your vase is beautiful! I wondered what those pretty veined leaves were – they form such a good foil for the other blooms. 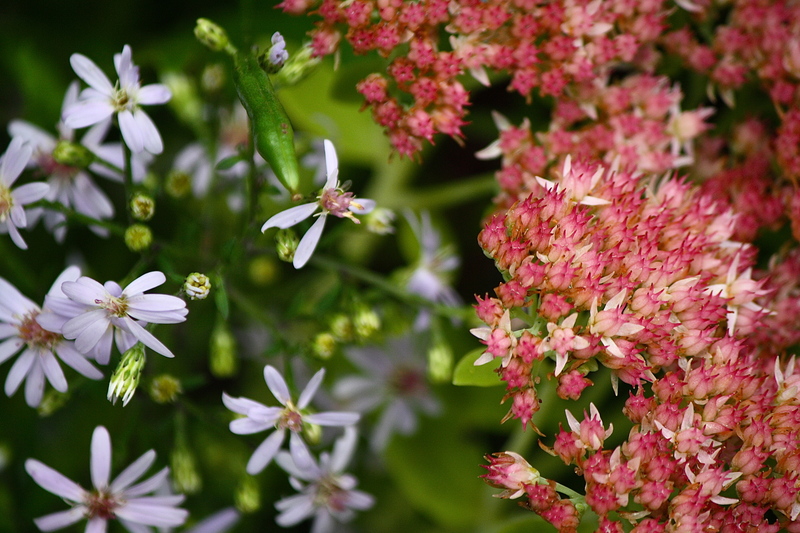 And how useful to have self-seeded cleome and nicotiana to pluck at will for vases – they go beautifully with the sedum and asters. Oh and thanks for telling us about Cathy’s crotchet project – how wonderful to be able to find the original pattern! Thanks, Cathy. You must have Perilla there? It seems like it would grow everywhere! Cathy really took the task and ran with it! When I looked it up I wondered if there was a connection with coleus although the emphasis seemed to be on it being an Asian herb. Thanks for your kind offer, but I have already ordered some coleus seed to try for next year so I shall say no – thanks anyway, Eliza. I love the loose, informal feel of this vase, Eliza! And the rabbit is a wonderful touch. Beautiful arrangement. And I’m glad to see that doily again! 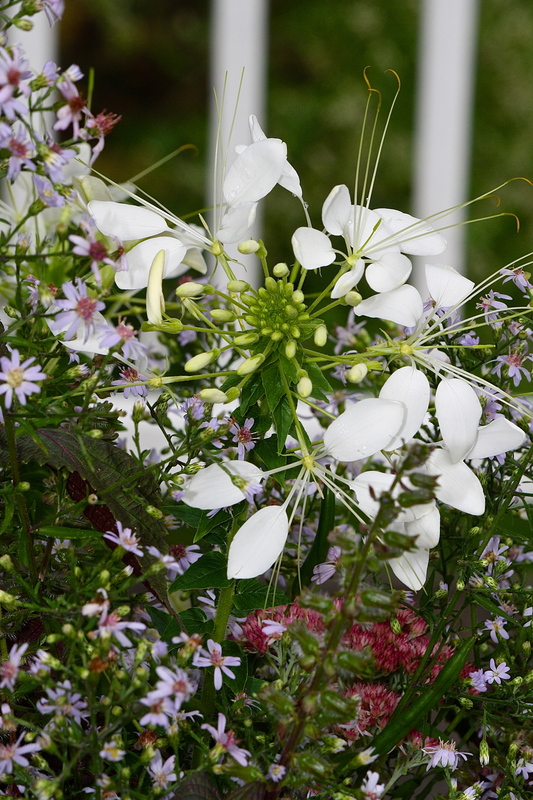 The Cleome looks fantastic and makes the whole arrangement look so fresh. I grew the blue Wood Aster for the first time last year and it was amazing. The whole plant was in a cloud of butterflies and moths for weeks. Does it last long as a cut flower? Do you do anything special like dip it in hot water? Depending on how far along a stem is in bloom, if full of buds, asters will last up to a week (each blossom lasts only a day or two). I never heard of dipping stems in hot water, which seems like it would rot the stems faster. I have heard of searing the ends of milky sap plants like poppies and euphorbia to seal them from ‘bleeding’ into the vase water. I change the water and recut the stems every couple days. I love this vase, Eliza! Such pretty and delicate colours and Asters are my favourite flowers at this time of year too (I call them Michaelmas Daisies) and since I don’t grow them, I treat myself to a bunch from the market. Beautiful colours. I love the firework effect of the aster and cleome, but those dark Perilla leaves are the best! Love your vase, it looks huge it would be lovely having that inside. I do admit I love that Perilla foliage even if it has taken over my garden. It even grows in my lawn! I read that you can use it for pickling – it turns things a beautiful pink color. I like to shave it into salads, too. It looks wonderful among that Sedum Eliza and the dash of white just makes your arrangement sparkle! I believe I’ve mentioned this before but I love your new mossy mushroom photo in the header. What an attractive aster that is and perfect with the Perilla. I have it in my garden but forget how nice that purple foliage is in bouguets. Thank you, Linda. Perilla has such pretty foliage that just begs to be used in arrangements! As always, I love your arrangement. I hope next year there will be enough in my garden to participate sometimes! Thank you, Sarah. I hope you can participate, too. It’s exciting to have a new place to garden, isn’t it? It’s great! I feel like I’m somewhat overwhelmed – I have so many ideas, I don’t know where to start! I will hopefully garner the will power to take your advice! You are sweet – thank you so much, Robin! Thanks, Robbie. Shiso is a beautiful plant, it fairly shimmers in the sunlight!